A lovely review from Crisis Group media director Andrew Stroehlein, posted on Reuters AlertNet (original here). As for Stroehlein’s concern in the last paragraph, let me state that I had never thought that anyone would be uncomfortable at my occasional mentions of girlfriends in the Middle East! I reckoned that eyebrows would more likely be raised at the book’s opening, in which I escape the attention of lustful Iraqi truck drivers in an Aleppo brothel — an episode chosen, as ever, as much for its comical as its dramatic content. Let’s start with full disclosure: I work with the author of this book. So, yes, I’m likely to say good things about it. 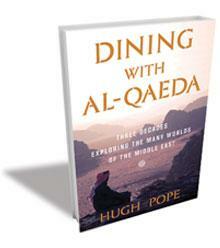 But, to be honest, I would anyway, because what my colleague Hugh Pope has done in Dining with al-Qaeda: Three Decades Exploring the Many Worlds of the Middle East, is at once revealing, convincing and, um, sort of fun. What I find most interesting in these memoirs of a newspaper foreign correspondent — from the good old days before newspaper foreign correspondents joined the endangered species list — are the parts of the book where Hugh describes the challenges of presenting ground-level truth in the Middle East to American audiences via US editors. Examining both the editors’ own biases and their perceptions of their readers’ biases, Hugh demonstrates in case after case how stories got watered down, had their emphasis altered, were scarred by a cliched headline, or otherwise ended up conveying meanings at odds with his original field reporting. It was frustrating, sometimes embarrassing, and it occasionally made his job more difficult by damaging important relationships in the countries concerned. Of course, this kind of thing happens between correspondents and editors, and reporting from the Middle East probably falls victim to it more often than that from most other regions. But the detail Hugh gives about the individual stories he was working on — what he saw on the ground, how his original text was framed, what the editors’ input was, where the problems crept in, and how the final copy read — is illuminating. For a news and media junkie like me, this sort of thing is fascinating. What Hugh also does is is show the diversity of people in the region, breaking down the all-to-common stereotypes. These are real people, not ideologies or symbols, and they have their individual interests and concerns. They laugh, cry, hope and express outrage for reasons Hugh makes clear. This is, of course, exactly why Hugh wrote the book: to break down some of the misconceptions the outside world, particularly the US, has of the Middle East due to one-dimensional media coverage — which, of course, he feels somewhat guilty for having played a small part in, however unwilling and unintentional. Dissecting the distortions step-by-step, Hugh exposes the problem. Day after day, much of the US mass media dehumanises people in the Middle East, deepening divides between cultures. Hugh’s book is one small push in the opposite direction.